Hanging with the Red Hats! I had lunch with The Ladybugs. These Red Hatters met at the Tilted Kilt where the waitresses are cute as a button and the fellas are in kilts. Eye candy for everyone! We ate a good lunch and chatted for a couple of hours. They let me blather on about Skeeterville, which I love to do. That was kind because my family gets tired of it and I’m always looking for new ears to bend. After lunch we had to have a picture together with the waitresses. So, I want to thank these ladies for putting up with me today and I can’t wait to visit with them again. After all, I am qualified to be a Red Hat! Posted by TeresaQuill on March 12, 2015 in Uncategorized and tagged Red Hats. She is one of my favorite seniors in Skeeterville and head of the resident board at the Friendly Arms Apartments. I can’t wait to see what she’ll do next! Before she retired, she was a math teacher at the local high school, the principal at the high school, and mother. The math class won several awards while she was teaching. Most of her students went on to college. She wanted to help children achieve their dreams which led her to become the principal. Her daughter rebelled and got a little wild while finding her path in life, but she settled down and grew into a fine woman. She’s a bank manager who comes to see Irene every week. Now 76, she keeps active by participating in the activities at the church on the other side of the park, and in the Birdwatchers Club. Irene is an organizer and has great observational skills. Because of her interest in mysteries, she has learned some intriguing skills. She can pick a lock, if it isn’t too complicated. She has read about what they look for at a crime scene and keeps latex gloves in her purse, just in case. She watches all the episodes of CSI and Law and Order on TV. Though she can be nosy and blunt, it’s always with good intentions.Because Irene values all the people in her life, she wants to help them. Always willing to take action to right a wrong, or solve a mystery, she feels the need to help fix problems, which can be a flaw when she goes overboard to help. Tidbits: She’s oblivious to the danger she puts herself into when she is investigating and carries a notebook to write down tidbits, or clues. When she starts pacing, her friends know she’s pondering a problem. Her solutions are. . .creative. She’s afraid of heights and snakes. She tried to learn to play the piano but found she had no musical talent. She tries not to cuss but sometimes one slips out. Her youth: Irene’s father worked at the snap factory until it closed, then he travelled to work down river at another factory. Her mother was a nurse until she was crippled, yet she still found a way to do projects to help soldiers overseas or the men who were out of work during the depression. Irene helped her mom around the house and drove to Frederick to go to Hood College and then home to fix dinner every night until she graduated and started working at Skeeterville High. She married a soldier who appreciated her energy after her mother passed away, and she took care of her dad until he died. 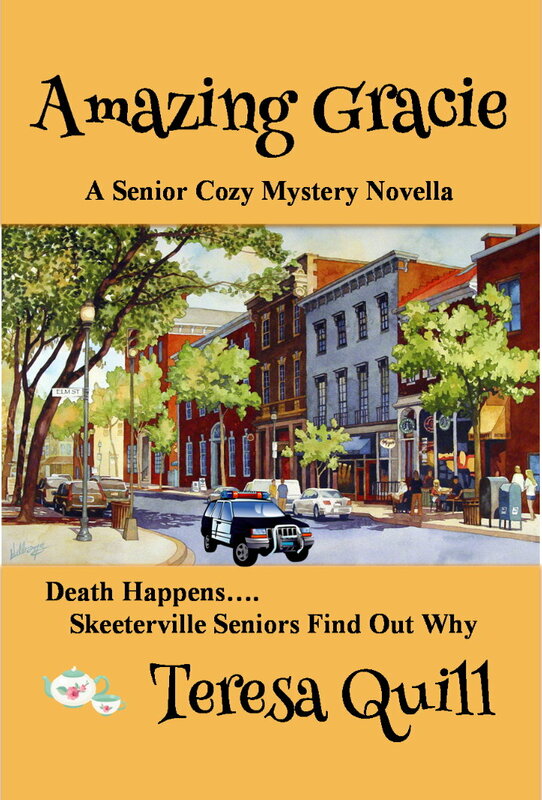 Watch for Hiding Miss Daisy coming in June. Mildred and Daisy are the two oldest residents of the Friendly Arms Apartments. Daisy is getting dementia. Her daughter wants to put her in Sunnydale Medical Center in the Assisted Living wing. BUT, there is unexplained death at Sunnydale. Irene is determined to find out why and is willing to go undercover to keep her older cousin from danger. Posted by TeresaQuill on February 24, 2015 in Uncategorized and tagged Irene, Skeeterville. Amazing Gracie is available NOW! Oh Happy Dance! My novella is ready for readers. I love these characters and the only way they can live on is when readers enjoy them too. As an author I feel a bit like a mom for these character kids- my ornery seniors. I hope you like them too. I have only dipped my toe in the publishing world but I have learned a few things to share. *Reviews are important for authors. Please leave a review where you bought your ebook after you read it. *Before authors are paid, 10% of the book must be read. I had no clue about this! If you get a book to read later, at least flip to 12% or so then restart it when you really have time, or no credit goes to the author, even though you paid. PS- Amazing Gracie costs 99 cents. *Mailing lists are important because we can’t control Facebook and other media outlets, but we can control sending you a spiffy newsletter once in a while. 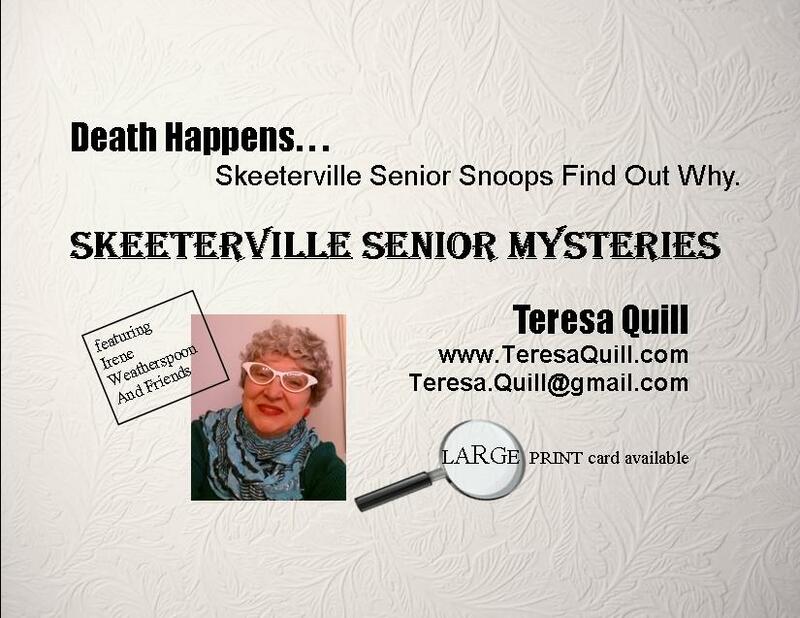 Please join my mailing list for more Skeeterville news and advance notice for upcoming stories. No spam-I promise! *Also, You don’t have to have a Kindle to get Kindle books. You can get Kindle on your computer, Nook, Android, ipad, ipod, or phone. Go to Amazon there are instructions there. OR install it from your app store. Easy and free. *You can pay Amazon for a Kindle book with a gift card you get at a store, or Paypal, or Visa. If you have an Amazon account, you are already set up. And, I learned how to make a tiny url today. which is that short web address that you see on Twitter. Tada! Sometimes it’s the little things that make me happy. 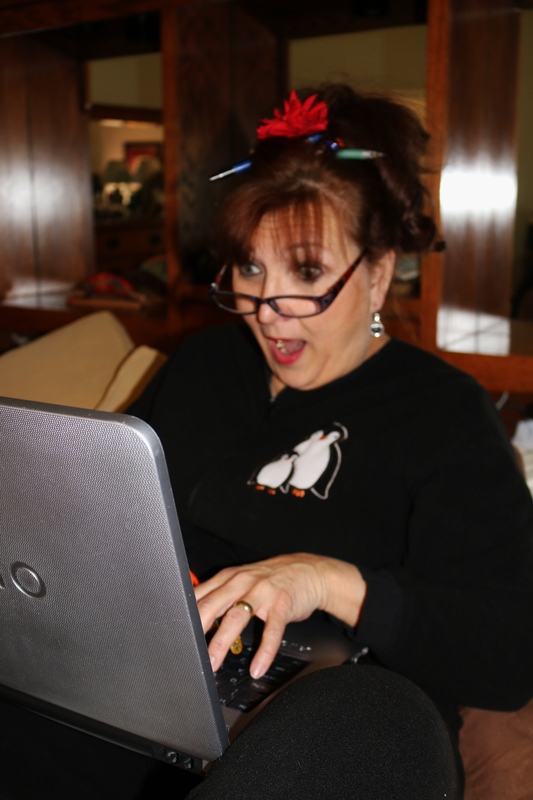 Posted by TeresaQuill on January 29, 2015 in Uncategorized and tagged Amazing Gracie, Amazon. I have the Pictures; Now to Publish! My goal has been to publish Amazing Gracie in January. January is almost over. There have been setbacks, BUT, I now have everything I need including an author picture. In fact, my photographer is so awesome I have many. Now to chose one to put in the book. Do I want the goofy one, the serious one, the normal look, or the glamour girl look? I will bring the hubby in on that decision. Oh, you will see them all at some point. We had hours of fun taking pictures. Lynn Kenny, thank you. Even when I became Irene Weatherspoon she didn’t run away in terror. And I made her take footie pajama pictures- a writer’s normal attire, right? Here’s a sample, and I have many more! So stay tuned. I am back on track an only have a few small hurtles before Amazing Gracie is available on Kindle. I will on publish my novellas in ebook format. I may print a collections someday, but not for a while. First, I have to write the collection. You can download Kindle on your computer. Go to Amazon and you will find it there. You can put a Kindle App on your Nook or iPad. It’s free. You can pay with PayPal at the Amazon Kindle Store. Yes, Kindle is run by Amazon. If you were able to come see me at my website, you can get Kindle. Posted by TeresaQuill on January 24, 2015 in Uncategorized and tagged Amazing Gracie, Irene Weatherspoon, Teresa Quill. 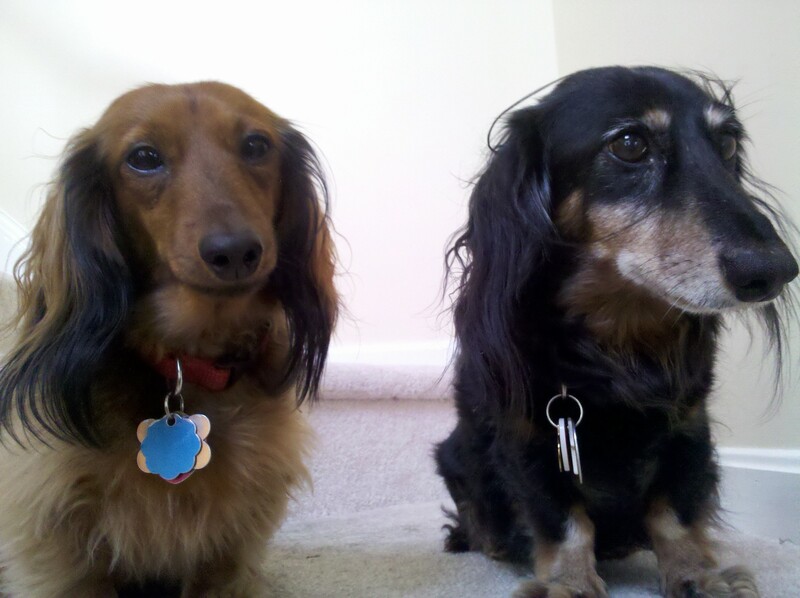 My publishing company is 2 Doxies Press! And this is my logo! I love it! My daughter helped me design this. I had this in mind before my 15 year old Otto crossed the rainbow bridge. So it’s my angel Otto on the right and Carmen on the left. At least once or twice a day I am reaching around a dachshund to type. Carmen lets me know when it’s time for her to go out, which is at least two or three times in a day. If it weren’t for my dog I would happily sit and not move from my keyboard. There are no doxies in Amazing Gracie, but one shows up in the next installation from Skeeterville. In this story, Gracie has a grey tabby named TicTac. John, my retired cop tries hard to make friends with her. The backstory on TicTac is that Gracie was walking to the hairdresser one day and thought she heard a cry from the alley behind a store as she passed. She stopped but didn’t hear it again. After she got her hair done, she walked home and heard the same cry. This time she investigated and saw the kitten inside a dumpster. She stepped on some boxes to reach the tiny furball and fell in. She saved the kitten but couldn’t get out of the dumpster until a man heard her yell and helped her out. That night, after they were both clean, she and the kitten sat on the bed together. She knew that she could never take the kitten to the animal shelter. Since residents of The Friendly Arms Apartments are allowed to have one small pet for a fee, she immediately put it into her budget. While they sat there the kitten reached out to her bedstand to play with a container of mints. She romped with them for a long time. That’s how she got the name TicTac. Posted by TeresaQuill on January 16, 2015 in Uncategorized. Did I tell you I was having fun creating my Skeeterville world? Oh, I am. Part of that is for Teresa to become Irene Weatherspoon once in a while. As Irene, I must be the uninhibited person that she is. She makes my stories more unpredictable and her friends add to the unexpected turns. I had a set idea about Amazing Gracie, and there was no cat. I expected it to be a sweet little story about an older lady who is losing her apartment, but then there was a murder to solve! Now I have a cozy little mystery. How did that happen? My seniors took over and I love it. As Teresa, I have to be somewhat aware that I must make contact in the real world. I was reminded to post here more often, and to get going on Facebook. I’m not sure about Twitter, but I’ll try. Today I got my business cards. Of course, I had to feature Irene. And I wanted to share this with you. I plan to release Amazing Gracie on the world in January via Kindle. Keep checking in and I’ll leave Skeeterville once in a while to be with you. Posted by TeresaQuill on November 4, 2014 in Senior stories. Welcome to my blog. I am Teresa Quill and I have been known to be random. And, isn’t this a wonderful place to put my random thoughts and poetry and. . .whatever! I hope you enjoy my odds and ends. Please leave a comment and say hello. I’d love to see you here. Posted by TeresaQuill on May 14, 2013 in Uncategorized.